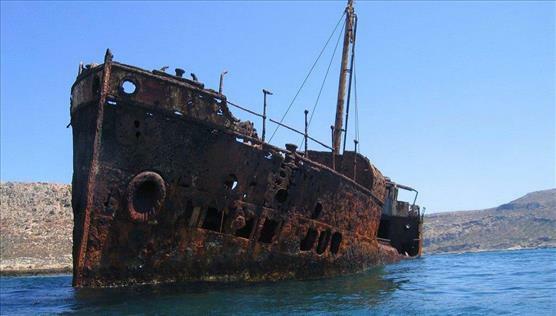 A rusty shipwreck, which has become a landmark of the area, is an interesting destination for spear-fishermen and also an ideal subject for those who love photographing shipwrecks. On 30th December 1967, the ship left Chalkida (a town in Central Greece) with a load of 440 tons of cement heading towards Northern Africa. 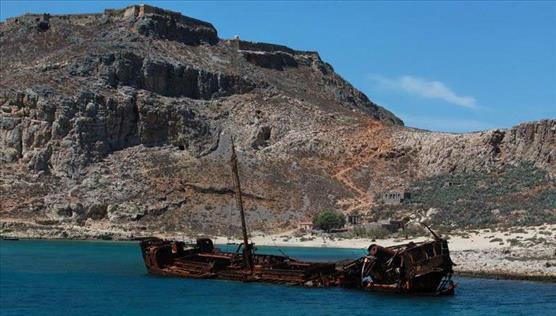 Due to the adverse weather conditions, the ship had to anchor in Diakofti Bay in Kythira. On 6th January 1968 it departed for its destination, but it again encountered bad weather and was forced to change course towards the northwest coast of Crete. As the storm continued, the ship was forced to anchor with both its anchors on the south side of Imeri Gramvousa, 200 metres from the coast. At 13:15 on 8th January 1968, as the weather conditions were deteriorating, the chain of the right anchor was cut. The captain tried to hold the ship straight with the help of the engine, but he did not succeed and the ship became stranded on its left side while the engine room flooded with water. Then the captain ordered his crew to abandon the ship and everyone disembarked safely in Imeri Gramvousa where they stayed until 10th January due to the continuing bad weather. Finally, the Greek Navy’s destroyer ship “IERAX” collected the crew members and transferred them safely in Souda. The wreck of “DIMITRIOS P” remains there up to this day and has now become an integral part of Gramvousa, together with other shipwrecks that have lain on the seabed for centuries.